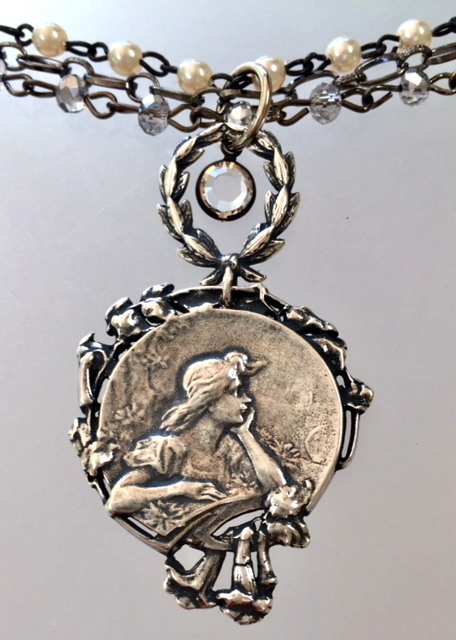 A Silver Art Nouveau Woman charm and a French WWI Wreath symbolic of Peace embellished with Florals.The woodland detail is amazing in person, somewhat lost in the photo. The lines of this piece are the embodiment of the Art Nouveau period!! This melange is poised on our Triple Stand design... a Single strand of Silver Crystals, coupled with a strand of delicate Ivory Pearls and lastly an etched link chain. Both pieces are cast from the original French pieces over a century old, this lovely reproduction is hand crafted. Necklace is 18”L, Pendant is 2" long (both charms) by 1 1/8" wide. Can be ordered any length.